For many years, people have shown great interest in my solutions to the entire CodingBat problem set. When I published my solutions, they were in fact the first complete set on the Internet, which might explain part of their popularity. The solutions I have published on my websites are for the most part quite straightforward. They are not always the most elegant. Furthermore, there are no explanations provided. This was enough motivation for me to work on a series of books on CodingBat. 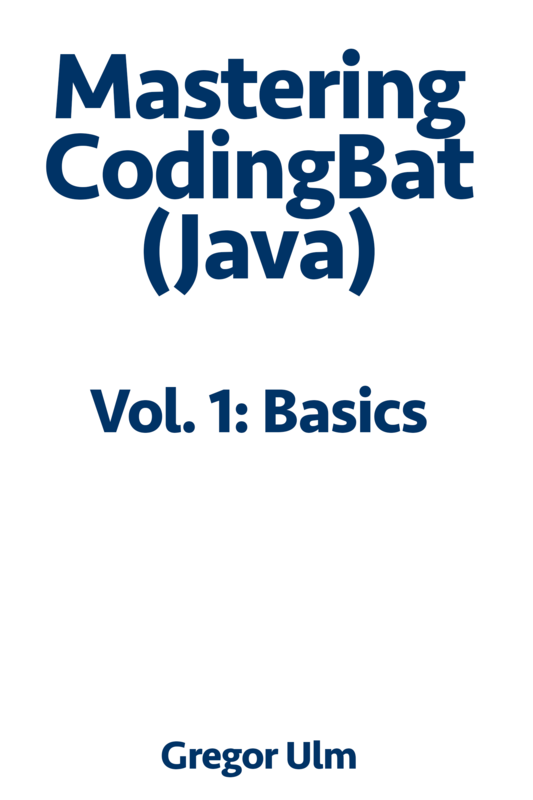 The first volume is now available as a paperback on Amazon: Mastering Coding Bat (Java), Vol. 1: Basics. This book contains extensive discussions of the problems in the sections Warmup-1, String-1, Array-1, and Logic-1. This is a total of 121 problems, which I discuss on 326 pages, using 357 code listings. On the product page on my blog you’ll also find a short PDF preview file, which includes the full table of contents and a sample chapter. This entry was posted in Products on April 12, 2018 by Gregor Ulm.